Harissa is a dark red, hot, and highly spiced sauce common across North Africa, from Morocco to Tunisia. It can be made with a variety of spices, usually inlcuding caraway, cumin and coriander seed. It’s wonderful as a marinade for meat. It’s a great seasoning for olives, lupinos, and feta cheese (perhaps together with preserved lemons). It works well as a side for stews and vegetables; or a sauce for kebab. It’s also perfect for a making a quick, flavourful pasta sauce. Because the spices are typical of many cuisines, from around the Mediterranean, into Iran and India, harissa is an ideal all-purpose condiment when you’re serving people who have variable spice tolerances. It saved my life in Japan, when spicy food was hard to come by, and my SO found even black pepper painfully hot. This recipe was initially taken from the (wonderful) World Food Cafe cookbook, but I’ve modified it extensively. 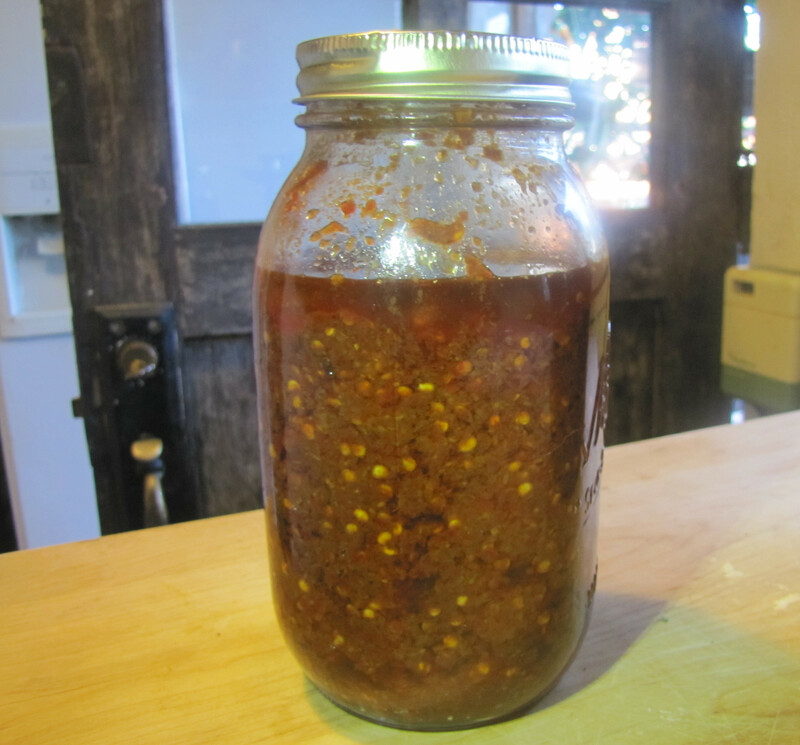 You can take whole dried chiles, and deseed them for a finer sauce, but the chili flakes work well. The dried poblano chiles add a welcome fruity roundness to the sauce. The spices are pretty flexible, and no two recipes use the same blend. I’ve even seen some recipes that call for rose-petals. 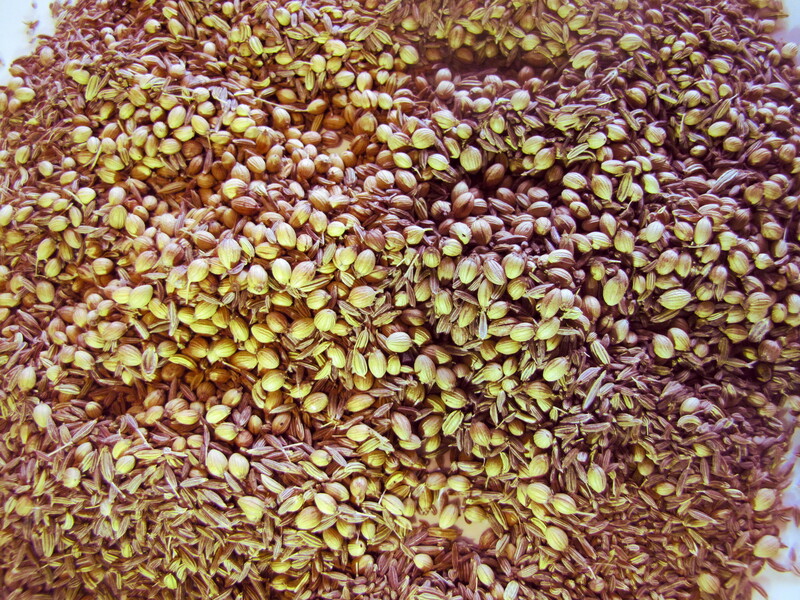 Cumin and coriander are the only two non-negotiable spices, but caraway is also standard. You can eliminate any of the spices listed, without too much problem. Harissa keeps well in the fridge, for weeks or months. Just be careful to top it up with olive oil occasionally, to cover the surface and prevent mold from growing on the top. Seed the chiles poblano and toast them in a hot pan, until they blister but don’t burn. Put the poblanos and chile flakes into a bowl, with enough boiling water to cover them. Depending on how spicy you want the harissa, you can either just cover the chiles (about 1 c of water), or add a lot more (2-3 c). 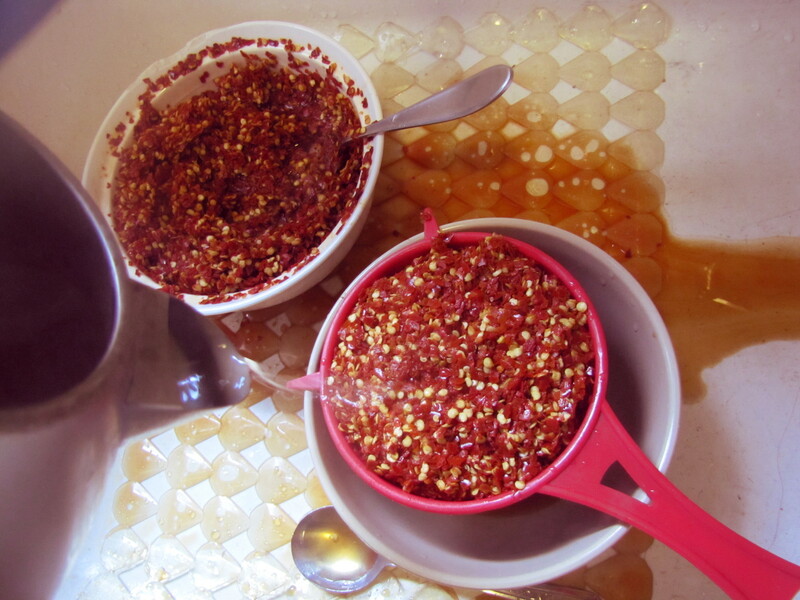 The more water you add, the more spice will be pulled out of the chiles. Increasing the proportion of poblanos will also produce a less-spicy, fruitier harissa. Let the chiles soak for at least 15 minutes. Be careful, the steam will be spicy and will probably make you cough — open a window, or put on a ventilation fan. Meanwhile, toast the spices in a dry hot pan over medium high heat. Start with the coriander seed. When this starts to puff up, add the rest of the spices quickly, in order, from fennel to ajiwan. When they are fragrant, and popping slightly, remove them from the heat, to a cool bowl, or mortar. Grind them to a relatively fine blend (there should be about 1/2 of a cup, final volume). Drain the chiles, and rinse them if they seem to be very spicy. Put the chiles, garlic, salt, olive oil, and ground spices into a food processor. Blend them together until they form a thick paste (the chile seeds won’t break down). Add extra olive oil if needed, to make a paste. Put the harissa into a clean bottle. Try to remove the air bubbles. Put a layer of olive oil over the top, to keep air from touching the surface. Let it sit out for about 3 days at room temperature. Over this time, it will become richer and more flavourful, and the colour will turn more intensely red.